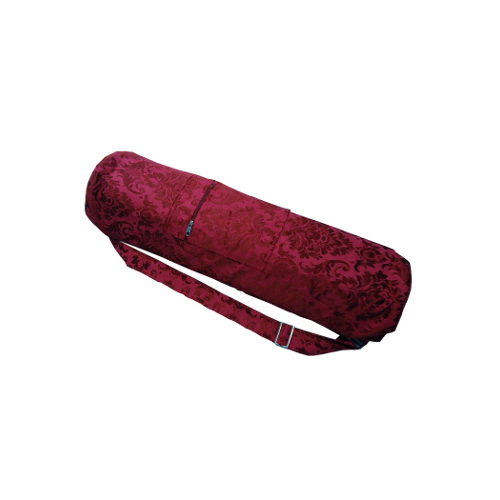 Carry your yoga mat easily and comfortably with our elegant, attractive Jacquard Cotton Yoga Mat Bag. This unique yoga mat bag is a spacious 76cm long and 22cm wide, making it a perfect fit for both the 3mm and 6mm sticky yoga mats, plus maybe a yoga strap, water bottle, or even a change of clothes. Made of 100% organic cotton and low-impact dyes, this high quality, fashionable mat bag has a strong, reinforced adjustable strap with a coated metal buckle, a large drawstring opening to easily pack away all your essential yoga props, and two zippered pockets on the inside and outside to carry keys, wallet, phone, etc.